The décor makes the most of earthy materials, from natural stone to bamboo floors. The six VIP suites occupy the top floor of the spa and include private relaxation rooms, some with personal multi-jet tubs. Offering both holistic and advanced skin care by Biologique Recherche and Miriam Quevedo, the spa entices with one-of-a kind treatments executed by a team a specialists. You’ll be offered a cool raspberry hibiscus tea and chilled towel, presented on a tray garnished with a fresh flower, once you sit down in the waiting area at the spa. These little treats instantly refresh and put you in a spa state of mind. Inside the relaxation areas lies a cascading waterfall built into one of the walls, across from which several dark teal chaise lounges with bolster head pillows beckon you to relax and catch up on the latest Vogue or Wall Street Journal. All therapists at the Miami spa have extensive training in their specific areas of specialty and practice, whether that's delivering pore-perfecting facials or soothing tense, tight muscles. The large and well-stocked spa boutique offers up workout clothing, scented candles, spa CDs (including the ones played throughout the spa) and a range of skincare products. On the second level of the glamorous spa, you'll find six lavish spa suites with amazing double-height, floor-to-ceiling views of Biscayne Bay. The affable staff is a great resource in finding alternatives if your desired service is not available. The spa recommends arriving a half hour before your treatment time to unwind in the steam room and sauna. 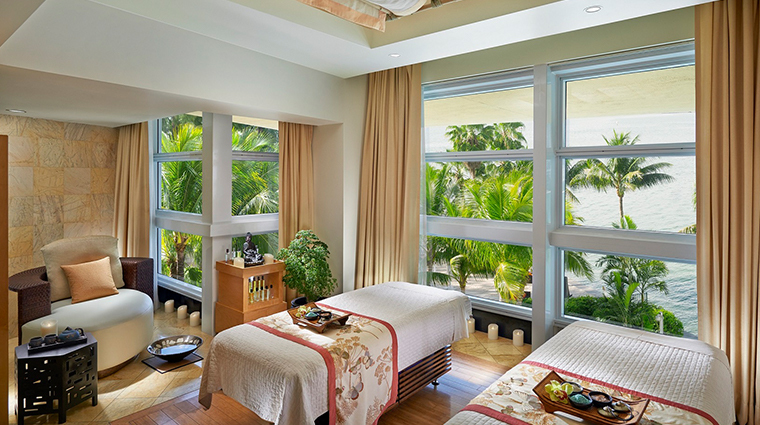 For pampering with a view, get a service in one of the six VIP spa suites with floor-to-ceiling windows overlooking Biscayne Bay. Using hot stones for calming warmth and kneading, the therapist focuses on deep muscle tension and works out lingering kinks. The big difference between the holistic foot treatment and the spa's other pedicure options is that this one includes an acupressure point massage, choice of aromatherapy massage oil and paraffin wax for deep pampering of the feet. The Ocean and Earth Body Wrap channels the spa's seaside location, with marine mud, algae or oshadi clay being applied after the guest's body is first exfoliated and then oiled. Caci products are like miracles in bottles., which explains why the Caci Intensive Lift Facial is so effective. The treatment incorporates a micro current that naturally lifts aging skin, while also reducing puffiness. Experience the Thai massage for a body rub and yoga in one. The therapist twists, rocks and stretches guests on a mat to deeply revitalize their minds, relieve joint pain, increase flexibility and balance the body. The attractive rooms include personal bathrooms, showers and additional space for specialty treatments like couples or Thai massages. Locker areas are spacious and well appointed, with a soothing oasis-like feel. Both short and long lockers are available (to accommodate hanging dresses or taller guests) and there are separate powder rooms and showers. In the ladies’ locker rooms, leather seats surround a circular mirrored console that’s stocked with combs, hairspray, hairdryers and styling appliances. The Kohler experience shower is a unique shower room with multiple jets, sound and lighting that can be adjusted to simulate different environments. After a soothing massage, you might want to opt for the sunrise setting, which bathes the room in warm light and includes chirping birds as its soundtrack. Also in the shower area, you'll find a sauna and large steam room, both great places to retreat post-service.